On the first Friday of December 1969, as Walter Cronkite prepared to report on the emerging details of the My Lai massacre and on the occupation by black students of the Harvard administration building, White House press secretary Ron Ziegler held an odd and frenetic briefing that did not focus on either of these things. The conflict veered instead into the fraught and partisan regional politics of college football, and to Richard Nixon’s self-anointed role in choosing a national champion: The next day, top-ranked Texas would play at second-ranked Arkansas, and the president himself would sit in the stands, and afterward he would present the winner with a plaque declaring this team the unquestioned no. 1 in the land. This whole plaque thing was Nixon’s call, and I’m sure it seemed like a clever tactical brainstorm at the time. Many Southerners had cast their votes for Nixon in 1968, but many others had sided with the segregationist George Wallace; further, an October article in the New York Times headlined “In the South, Football Is a Religio-Social Pastime” — which, I suppose, still qualified as news back then — had been making the rounds among the White House staff. This was college football’s centennial season, and the Texas-Arkansas game (which had been moved to the final week of the regular season, largely through the efforts and foresight of a shrewd ABC television executive named Beano Cook)1 was its marquee matchup: By sitting in the stands, as he often did at sporting events, Nixon could present himself as a “regular guy,” and by serving as the arbiter of college football’s perpetual Argument, Nixon could present himself as a declarative authority on the sport. And in so doing, he could appeal directly to a pair of Southern states2 that figured into his overarching strategy. Plus, Richard Nixon genuinely liked college football: A few weeks earlier, he’d marked the occasion of a 250,000-person anti-Vietnam rally outside his home by staying indoors and watching Ohio State beat Purdue by four touchdowns.3 And this visit would, his staff figured, be a good look for a man who often appeared out of his element around people of any kind. Ziegler responded by saying he was certain that the winner of the Texas-Arkansas game deserved the national championship, and then, realizing that this was an unsatisfactory response on both political fronts, he sprinted back to the Oval Office, huddled with the president, and said his boss was considering an “appropriate” gesture if Penn State also finished undefeated. A reporter asked, “What sort of gesture?” and Ziegler retreated to the Oval Office again, returning shortly afterward to say Penn State, which had not lost in 29 straight games, would be rewarded with a plaque honoring them for having the longest undefeated streak of any major college team in the nation. Someone else asked if the president was sorry he’d gotten involved in the controversy in the first place. But the press secretary did not answer the question. By then, Ron Ziegler had left the room for the last time that day. That week in Fayetteville, a black student protesting the band’s playing of “Dixie” was shot in the leg by an unknown assailant on campus; a group of black students considered lying down on the field at halftime if the band played “Dixie” again. Vietnam protesters gathered on a hill near the stadium and displayed a peace sign made of crosses during the game. None of this made the national news at the time — in his accounts of Texas’s 15-14 win both in Sports Illustrated and in his book Saturday’s America, Dan Jenkins does not mention these peripheral occurrences, choosing instead to zero in on partisan zealotry, as in a church marquee displaying a pro-Hogs message. 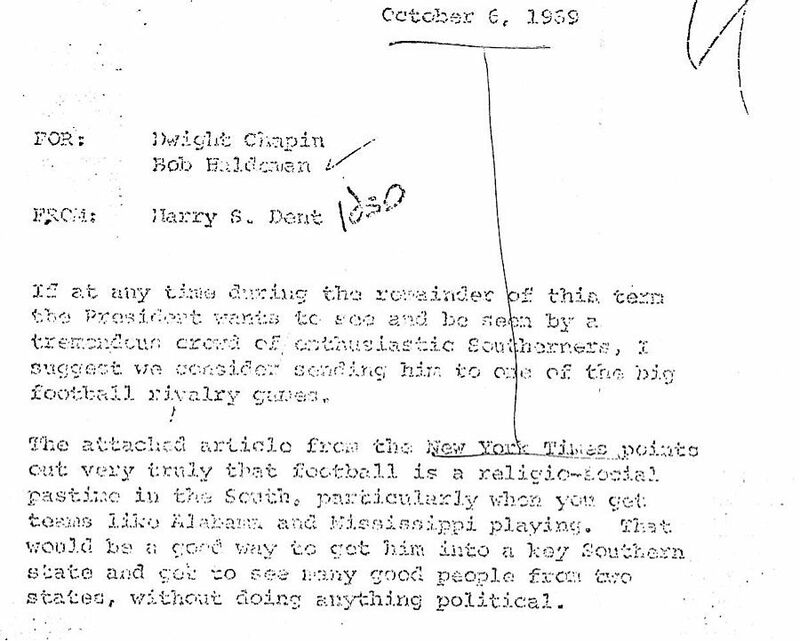 And yet, taken together, all of it helps explain why Southern college football took on a symbolic political importance to Nixon in 1969: Because everyone involved seemed to recognize that this game, with nary an African American player on either roster, was the last of its kind. I imagine if you polled the crowd that day, they would have been overwhelmingly pro-Wallace, which is pretty much the unsubtle subtext of Harry Dent’s memo (it is remarkable how two paragraphs that end with the words “without doing anything political” can be so rampantly political). Beyond that, both coaches were highly respected authoritarians who still held sway at a moment when the traditional dominion of the football coach was under siege in much of the rest of the country. 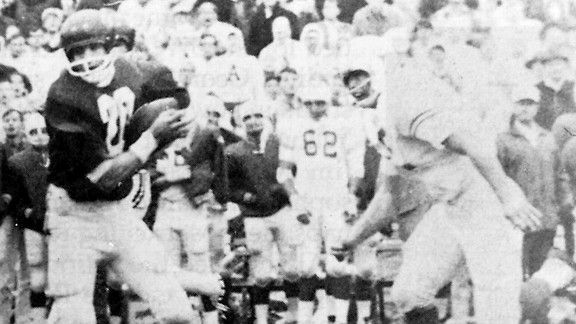 You could feel the college game shifting underfoot in 1969: At Oregon State, black players protested after a linebacker was kicked off the team for refusing to shave his beard and mustache. At Maryland, coach Bob Ward resigned after slapping several players during an offseason workout, prompting alumni, parents, and administrators to berate the school’s athletic director for letting “the hippies overthrow the coach.” At Wyoming, 14 black players who asked to wear armbands during a home game against BYU to protest the Mormon church’s racial discrimination policies were suspended. At Washington, four black players were suspended for a lack of dedication to the program. And at both Indiana and Iowa, 16 black players were suspended for boycotting a practice. Sports Illustrated‘s John Underwood ran an alarmist three-part series titled “The Desperate Coach” (although as author Michael Oriard pointed out, he did not quote a single player in any of the articles). And it is easy to flash forward seven years, to the eve of the American bicentennial, to a time when the old ways had passed, to a moment when a fictional Texas football coach delivers essentially the same speech in Richard Linklater’s Dazed and Confused to absolutely no effect. “They were the last of how it was,” Frei writes of the ’69 Longhorns, and I suppose to Richard Nixon, this was what mattered. Even if he rewarded the wrong plaque to the wrong team, he’d still be appealing to the right people. Presidents entangle themselves with sports to political ends all the time, but never had there been such a direct and unambiguous declaration from a chief executive as the one Nixon made by inserting himself into the ’69 game. Any real opportunity Penn State had to capture the national championship, beyond a Texas loss in its bowl game, had essentially been quashed. With Penn State, it was, as always, a matter of perception: One hundred years after its origin on a thatch of New Jersey mud, Eastern college football was considered weak and inferior, and the Nittany Lions’ unbeaten streak was seen by many as nothing more than an intriguing footnote to the national conversation. Joe Paterno had inherited the head coaching job from his predecessor, Rip Engle, in 1966, and after tying Florida State in the ’67 Gator Bowl, the Nittany Lions went through two straight seasons without a loss — and without a national championship to show for it. In 1968, they finished second behind Ohio State; in 1969, they were again mangling inferior regional competition when the Texas-Arkansas contest suddenly emerged as the third “Game of the Century” in the past four seasons (one Midwest, one West, one South). Four years after the game and its controversy unfolded, addressing a commencement crowd at Penn State in a soaring speech that only further elevated his place on campus, Paterno made a joke about Nixon knowing so little about Watergate in 1973 and so much about college football in 1969. It would take nearly four decades, but eventually the politics that moment engendered would catch up with him, too. In the end, Richard Nixon chose an excellent college football game to attend, a game that came down to the wire — a game that may have, in fact, included the two best teams in the country that season — but what’s most intriguing about it all these years later is that both teams went for broke. It’s almost as if they seemed determined not to get caught in the same trap that had ensnared Michigan State and Notre Dame in 1966, and Army and Notre Dame in 1946. Here were two conservative coaches who seemed almost determined to defy the stereotypes about them: Trailing 14-6 after his team scored a touchdown in the fourth quarter, Darrell Royal chose to go for two right then and there. “If you wait until the last touchdown, it’s all or nothing,” Royal said, and quarterback James Street8 ran a counter option for the conversion. So Broyles didn’t subvert conventional wisdom this time, and quarterback Bill Montgomery threw an interception in the end zone, and the Longhorns got the ball back with 10:34 to play. But it worked, and it picked up 43 yards, and Texas scored the winning touchdown a few plays later, and then the president himself came into their locker room, wearing makeup for television cameras and clapping the winning coach on the back. Texas, he declared, was the undisputed no. 1 in the land, and then he mentioned the secondary plaque he’d bequeath to Penn State, the idea he’d formulated that afternoon as Ron Ziegler scurried back and forth from the press room to the Oval Office. “Is that fair enough?” Nixon said. That there was nothing fair about it was simply the accepted wisdom of college football in 1969, just as it had been in the decades preceding, just as it would be for decades to come. And anyway, college football was not any fairer than life itself at that moment: Five days before the game, a draft lottery was held, the first since World War II, which kind of made this whole thing feel a little less consequential. Still, Nixon spent the next few days trying to walk back his comments, to play both sides as well as he could. At a press conference the Monday after the game, asked about how he might reach out to the youth of America, he made an awkward joke about not speaking to them by picking the no. 1 football team. Then he walked off the podium, which, I suppose, is the closest we get to Nixon dropping the mike. The next night, addressing the National Football Foundation and Hall of Fame banquet, Nixon said Penn State should be considered for no. 1, and then, in his closing remarks, he said, “I think Texas deserved to be no. 1.” Ziegler sent out letters denying that the president had declared any team the national champion, which seems like a stretch considering the plaque Nixon gave away explicitly declared Texas the nation’s no. 1 team; still, after the Longhorns beat Notre Dame in the Cotton Bowl, thereby “validating” Nixon’s choice in both the Associated Press and United Press International polls, there wasn’t much more for anyone to say. Texas had won the argument, and everyone had settled into their respective positions, and nothing could ever be done to resolve it. So here was yet another unsatisfactory denouement, marred by pandering and infighting and egotism. It was the politics of the presidency and the politics of college football, as we had always known them to be. This article has been updated to correct a reference to a score in the fourth quarter of the Texas-Arkansas game. “ABC came out looking smarter than a treeful of owls,” Texas’s Darrell Royal told Terry Frei in his book Horns, Hogs, & Nixon Coming, which is exactly the kind of thing I like to imagine Darrell Royal will say if I ever meet him in the afterlife. Nixon lost Texas in 1968 by fewer than 40,000 votes to Hubert Humphrey, while George Wallace garnered more than half a million votes in the state; Wallace won Arkansas by about 46,000 votes over Nixon. Nixon was described as a “fearless, if ineffectual” player while warming the bench at Whittier College. Nixon had lost Pennsylvania by fewer than 170,000 votes to Hubert Humphrey in 1968; without Wallace on the ballot, he might have won it. “A football weekend when two big Southern schools clash is largely an all-white event,” read the October Times article that so enamored the White House staff. The Buckeyes, who had been dominant all season long, would lose to Michigan 24-12 in their season finale. Nixon reportedly cut a budget meeting short so he could watch, then later had a television set up in a dental office so he could watch the finish while keeping his appointment. Not to be confused with this guy, though I assume one’s name was at least partially inspired by the other.